Police in Lebanon, New Hampshire have arrested a man accused of stabbing two people and setting three fires intentionally, one of which was at a church. One fire tore through the First Baptist Church on Dec. 28. The 3-alarm fire started in the rear of the church on School Street just before 11:30 p.m. and destroyed much of the building, according to fire officials. One firefighter was taken to the hospital for a minor injury after slipping on ice. 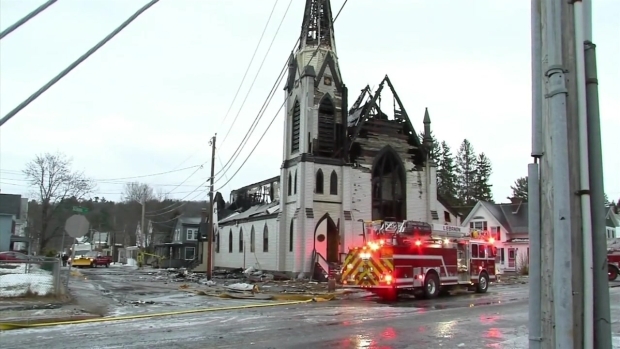 A blaze tore through the First Baptist Church in Lebanon, New Hampshire, late Wednesday night. The second fire was located at 68 Mascoma St. on Dec. 29. Following investigation, police identified Anthony Boisvert, 27, of Lebanon, as a person of interest after the fires were deemed suspicious. On Sunday at 9:10 p.m., police received 911 call regarding a stabbing that occurred at the Boulder’s Condominium complex at 20 Wolf Road. Neighbor Rosemary Fox said she heard the dreadful scream from across the hall when her neighbors had been stabbed. Fox said she called 911 right away while her mother went to help. “Wade [the victim] was drenched in blood from his neck down to his knees,” said neighbor Kathy Willis. The two victims, a 52-year-old man and a 66-year-old woman, suffered serious stab injuries and said Boisvert was their attacker and fled after stabbing them. Boisvert was located around 10:15 p.m. on Tannery Lane and was taken into custody. “It was really concerning for my wife and I,” said Albert Craig, who lives steps away from where Boisvert was arrested. Boisvert is facing two counts of first-degree assault and three counts of arson. Police believe he is responsible for another fire on Jan. 16, 2016 at a building at 174 Hanover Street Extension. He is being held on those charges and will be arraigned Tuesday. Both stabbing victims are expected to survive.